It was the birthday of my neighbor across the street, a neighbor I have become very close to in the last several months. It was also her first birthday since the death of her husband in early April. When we walked the day before yesterday she told me “…it’s just another day…” but to me, a birthday is to be celebrated-new life is always a blessing to be celebrated. Knowing it was the first birthday since her husband’s passing, I wanted to make sure I acknowledged it in a special way before she met with her family later to celebrate with them. Wings a bit dryer….not much longer now! In the morning I texted to see if she wanted to take our neighborhood walk, then quickly stuck some breakfast cookies in the oven to take over with a card. Three minutes before the cookies were due to come out of the oven, I got a text from her: ” A Monarch butterfly has just emerged from its chrysalis, come see!” Funny, just the day before I noticed all the milkweed in her garden and meant to ask if she had ever seen the Monarchs hatch. The cookies couldn’t come out fast enough, as I was sure the newly emerged butterfly would take flight before I could cross the street! As it was, I arrived in plenty of time to see the newly transformed Monarch since it was at least another hour or so from taking flight. My oldest son was off that day so was also able to come enjoy the scene with us, reminding me of the time we watched a newly emerged butterfly take flight when he was young. As we talked and marvelled at the beauty of nature, I couldn’t help but think what a beautiful gift of new life she had been given on her birthday. She said she had never witnessed a butterfly emerge till that morning… a touching reminder that life does indeed bring renewed joy after pain. Until next time, may you experience renewed joy and wonder in your life as well. When I look back on my childhood, there is one movie that will always stick out in my mind as a favorite….Bambi! Somehow I think I’m not alone in that sentiment. I was able to shoot a few more pictures before it ran off to the more heavily wooded area. All the pictures in this post, with the exception of one, are shot through the window and some at a distance, so they won’t always be the clearest. After I greeted her with a “good morning,” she took off. Apparently she likes eating our flowers in solitude, or maybe her guilty concious got the best of her. Either way, we would have enjoyed having her company a little longer. Our flowers were not the only ones the deer enjoyed as evidenced when I peered across the street to my neighbor’s yard. In the above picture, the smorgasboard had just begun. They casually made their way all across her lawn, munching as they went. Knowing she doesn’t bother to shoo them away anymore than we do, I captured all the pictures I could to share with her later. She had told me previously that she has counted up to eight at one time in her back yard at dusk and is captivated by their visits as much as we are. One of the fawns is on the far right, the other on the left, very heavily camouflaged. The picture is the best I could get with only a cellphone, and though I have walked back several more times to try to capture them with a real camera, they have unfortunately proven to be camera-shy. We saw them a few more times when driving by, but my neighbor has informed me that they haven’t been around for the last several days. In his words “they have eaten all the flowers we had, so they took off.” Neither he nor any of our neighbors seem to care that their flowers have been digested by Bambi and friends, and that is one of the reasons I love living here! She was just casually strolling along for her morning walk like the rest of the neighbors when my sweet Princess alerted me to her. I hope you have enjoyed my version of Bambi, Until next time! For the Love of Weeds-Pt. 2…Round-Up Pesticide, Blessing or Curse? Well, I certainly never thought I would do a part two on a blog post having to do with weeds, but here goes! This post has to do with my statement about my intense dislike of Round-Up, and I have been asked to explain why I hold that opinion by fellow blogger Michelle at one of my favorite blogs, https://rabbitpatchdiary.com. I’ll add some pretty pictures to hopefully charm it up a bit! The material out there is vast, but I will do my best to sum it up in as brief a post as possible. I will post links at the end of this post so you can do your own follow-up studies and draw your own conclusions. Hopefully for the sake of the environment and ultimately your health and those you love, you will reach the same conculusion as I have come to, and look for alternative methods to control weeds. When I am not pulling, this recipe is a simple one to use and it works! One of my main sources for health news is Dr. Mercola, and I have read many articles relating to the dangers of Round-Up on his website alone. I will use other sources for this post, however, to give a broader analysis of the topic. According to the Dr. Mercola article, Monsanto is Inside Everything. this so called crop-saver is showing up in urine samples, breast-milk, blood samples, water supplies, and in the very air we breathe. A study reported by The Detox Project reported that glyphosate, the active main ingredient in Round-Up, was found in women’s breast milk at 760-1600 times higher than the level allowed by the EU in drinking water. So the purest form of food for the tiniest among us is now contaminated by man-made killer chemicals! Further studies showed glyphosate crosses the placental barrier with 15% reaching the fetal compartment. Blood samples and urine samples in Canadian and US women respectively were found to be at maximum levels for urine and levels similar to the concentration found to have endocrine-disrupting effects in vitro in the blood samples. While on the topic of embryonic health, the inert ingredient, polyethoxylated tallowamine, or POEA, in Round-Up was actually found to be more deadly than the active ingredient, glyphosate, according to the article in the Scientific American Weed-Whacking Herbicide Proves Deadly to Human Cells. In this article, evidence is shown that just because an ingredient is listed as inert-Federal law classifies all pesticide ingredients that don’t harm pests as “inert,”-doesn’t mean they aren’t necessarily biologically or toxicologically harmless. “This clearly confirms that the [inert ingredients] in Roundup formulations are not inert,” wrote the study authors from France’s University of Caen.“Moreover, the proprietary mixtures available on the market could cause cell damage and even death [at the] residual levels” found on Roundup-treated crops, such as soybeans, alfalfa and corn, or lawns and gardens. So what if you don’t use Round-Up… why should you care…doesn’t it simply disappear after it kills the weeds, isn’t it “biodegradable” like we are told in most places that sell it. Furthermore, if you eat, you need to care…Glyphosate is sprayed on some crops right before they are harvested to help then dry out. Monsanto’s patented genes are present in about 95 percent of U.S.-grown soybeans and 80 percent of our corn.In 2014, Roundup Ready crops accounted for 94 percent of soybeans and 89 percent of corn. Between the two, these crops cover more than half of America’s farmland. The problem is certainly not limited to America… In Argentina, where Monsanto’s Roundup has turned the country into the world’s third-largest soybean producer, a report by the Ministry of Health revealed that, between 2005 and 2009, cancerous tumors were double the national average in the areas where GMO crops are grown and agro-chemicals like Roundup are used. Now, more than 30,000 doctors and health professionals in Argentina are urging the government to ban Monsanto products. (https://draxe.com/monsanto-roundup/). To help yourself and your family, look for organics and foods labeled non-GM0 whenever possible; shop at local organic farm markets if available and if you eat meat buy only organic, 100% grass-fed or non-gmo food fed animals, ideally from a local farmer you can get to know; on-line sites such as Vita-cost sells organic non-perishables, and they offer great sales from time to time. Shop around, your health is worth it! A list of the top pesticide ridden foods and ones you can get by with not being organic can be found here: http://borntogrow.net/dangerous-pesticide-ridden-foods/ Also, soaking veggies and fruit in baking soda for 15 minutes can remove some of the pesticides, depending on the food, but even that labeled organic should be soaked. A very interesting chart, one that would be very hard to argue with, shows the instances of autism rates with the rise of glyphosate usage, please use the following link to see the astonishing chart as well as watch a very informative interview with Dr. Stephanie Seneff, a research scientist at the Massachusetts Institute of Technology (MIT), revealing how glyphosate wrecks havoc on human health. I am going to stop here, but trust me, this only scratches the surface! There is so much more that can be said and explained, but this post is very long as is!! And please note, though this post is about Round-Up, pesticide use in general should be thoroughly looked into. Please see the links below, and especially read ways to avoid consuming this chemical, and many others, even if you are against using as I am. I may add a third post for nutritional ways to combat toxins and another on the beauty and nutrition of certain weeds, inspired by Barry. I will say in closing, it is a shame that those of us who try to protect the earth we have been entrusted to take care of are sometimes dismissed as hippies, crazies or over-zealous earth-worshippers. I don’t worship the earth, though my “About” picture certainly portrays me as a tree-hugger 😉 I do, however, worship the God who gave me this beautiful place to live and I believe as a Christian I am responsible even more to show gratitude for what He made and gave as a gift…this incredible creation, including ourselves, that we are to treasure and take care of. Until next time, please let’s all do our part…the adorable subjects in the pictures, and those in the future will be glad you did! For the Love of …Weeds! Yes, that’s right, weeds, and let me tell you, there was a whole lotta love happening in my front garden today! This has been the rainiest summer I can ever remember in my lifetime. And when it was not raining of late, the temps soared to the ninetys, when rain was once again a welcome relief. Given that combination of weather, other things of more importance to be done, throw in an out-of-town trip on top, and my weeds absolutely thrived! Now, I am surrounded for the most part by neighbors with pristine yards who have an ongoing love affair with Round-Up. I could spend a whole post on my hatred of that substance, but since this is a blog focused on “beauty” I’ll forgo that soap-box. On the other side of that scenario, when weeds are pulled by hand, there are those occasions when you are that neighbor. Since I really don’t want to be that neighbor, and usually I am not, I apologized before taking off on my trip to my fellow outdoor enthusiast across the street and assured her things would be restored to normal when I returned. Since she and I have a shared love of gardening and spent many hours chatting across the street as we happily sweat and battled the weeds, she had no cause for concern. The first few days back I had other things to catch up on, so I pulled a Scarlet O’Hara and chanted “tomorrow,” but, today was the day! As I contemplated the task ahead of me, I assure you I was not at all looking forward to it. After a quick walk down the street in search of the elusive twin fawns, I donned gardening gloves and hat and headed toward my foes. Or were they? I had not been pulling for more than a few minutes when the thought occurred to me that this was not at all the horror I expected, and I quickly became thankful for the time of quiet contemplation. Usually alone-time in the morning with a cup of coffee is all that’s needed to start my day, but this day I needed some activity along with my quiet, and my weeds proved to be just the thing. I know they are considered a cursed nuisance to the garden, but on this morning as I pulled…I prayed, Bible verses came to mind, and I remembered the Creator always has the best answers…sometimes shown through a good patch of weeds! Until next time, wishing you your own patch of weeds, if needed! Last night we were under torrential downpours with lightening strikes all around us and a tornado watch in effect. Both our sons had not yet returned home for the night, but my husband and I went to bed, saying prayers for their safe return while keeping one ear open, as all parents do, when awaiting their kid’s return. I think of my own mother, how on earth she survived raising five children, and how many nights she and my father must have prayed as they waited for their children to return home each night. My mom was not only a terrific mom, she was also my confidant and friend….sticking with me through thick and thin….cheering me on, encouraging me when down, and always believing in me no matter what. She was and still is a source of inspiration to myself and so many. One of her greatest accomplishments, which still amazes me, was earning her nursing degree while raising five children. I can still see her in my mind’s eye sitting at the table doing her homework after we finished dinner, which she had also prepared. Now that I have raised two sons myself, I am even more amazed at her accomplishments and am not sure which is more amazing, earning the degree or raising five children….probably the latter! Eventually our first son came in with a few friends in tow, an hour later our oldest son safely returned home as well. Both stopped in to give us big hugs before heading off to their own beds, and my mother’s heart could rest peacefully knowing my beloved treasures were back safe and sound, and all was right in my little world. Happy Mother’s Day to my fellow mothers! It is a quiet Sunday morning as I write this. The air is cool enough to leave the door cracked just slightly, allowing the sounds of nature to flow inside. The birds are singing their morning songs as they flit around in their busy springtime activities. A tufted titmouse pair are continuing their gathering of nest-building material for the box just outside my window, while a hummingbird stops to sip at the nectar feeder just below the future titmouse abode. A squirrel enjoyed an early breakfast of sunflower seeds scattered beneath the feeders before attacking the feeders directly. In due time he was joined by two other squirrels that soon gave him chase before they all raced up a tree, resembling a reverse playing of firemen sliding down a pole. The male cardinal is visiting another feeder closer to our pond, and the sounds of the waterfall flowing fills the air with its soothing sounds, in perfect harmony to the music of the wildlife surrounding it. The creek is at high-tide and is still and deceptively quiet under a misty haze and overcast sky. In the surrounding trees, the birds and squirrels make up for its silence aided by honking geese in the distance, while cinnamon ferns, jewel-weed, and iris decorate its banks as they continue to spring more to life with each passing day. Somewhere nearby a wood duck couple are certain to be enjoying its serenity, while playful otters and busy beavers are certain to be disturbing it. At any given moment an eagle is likely to do a fly-by low along the creek, or perch in one of the nearby trees watching for fish and other small creatures to fill its stomach and feed its young. 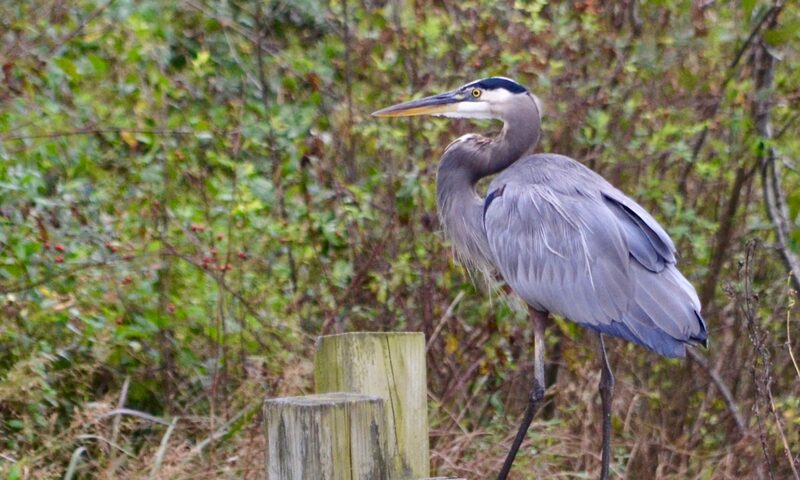 Harold, our resident blue heron, has yet to my knowledge made his daily appearance, but that too could happen at any given moment and may even include a sighting of Henrietta, seen accompanying him of late…tis the season! Peaches, the cat of unknown origins, who has unfortunately decided to adopt us, draws my eye away from the creek again as he takes up one of his favorite spots beside the pond…much to the dismay of Gabby, and Bitty as well, who is perched beside me now glaring at him from her window seat. The cardinal seen earlier is now perched closer to my window, almost hidden in the lush leaves, until roused by a blue-jay who was earlier hopping up and down on a branch above him and making a general ruckus. For whatever reason, Mr. Jay felt the need to antagonize the cardinal until deciding to fly off towards the creek with the cardinal giving chase. In a break from nest-building duties, Mr. Titmouse flies over to give his wife a morsel on a nearby branch, and the lone squirrel is back posing for a picture. Our door is now shut and the fireplace is lit to chase off the chill-enticing kitty with its warmth-as my husband and I enjoy the quiet of early morning. The wood ducks paddle into view, and all seems right with the world. …because sometimes in our single “focused-ness’ of life we miss the peripheral beauty going on around us, and that is a lesson in and of itself. My favorite spring month has finally dawned…and its opening show is as breathtaking as always! Warm wishes for a beautiful month of May in your corner of the world. I think there is an unwritten rule in the blogosphere that an anniversary post is to be written each year, and though it seems much too soon for a year to have gone by, here goes!! Thank you to all who have stopped by to visit, and all those with a friendly word to pass along. Thank you especially to those who have become “friends” in this community. You are a very positive, encouraging group of people who have enriched my life with your words and talents. This blog was originally intended as a place for me to catalogue mostly nature, but family memories as well for both myself and my sons to look back on, but you have made it so much more. So many wonderful people in this big beautiful world, I wish I could share a cup of coffee with you all and get to know you a little bit more! but to enjoy sharing in your journeys as well! Above, the very loud and large pileated woodpecker, and below, one of our backyard monkeys, doing what they do best. I took my buddy, Princess, along for our walk. I wouldn’t dream of leaving her home, the neighbors love her and sadly our walks are soon coming to an end. 😦 Watching her health deteriorate has been the hardest thing this month, I hope she will be with me for some warm spring days, but she is getting tired so I will enjoy the days we have left and treasure her companionship while I can. The sure promise of warmer days here on the creek are the first wood duck sightings, usually blurred by the distance, but they still make my heart sing! Things will only get more beautiful with the blooming of Azaleas right around the corner, but I was treated to an early show of their charm in our recent southern excursion. For now, I will enjoy the warming days in our area, thankful for the beauty each new day brings. Number Four is at the Door…. With our fourth Nor’easter, it’s now apparent that March does indeed intend to go out with a roar! I’m not complaining, getting to sleep in as school was cancelled, leisurely drink coffee while enjoying spelt-blueberry pancakes, in no rush to be anywhere, is fine with me. I’m not sure how the flowers and budding trees will feel about it, but it is what it is, so I decided to capture a few pictures and watch the progress as we have transitioned from morning sleet to now thick flakes, on this second day of spring. A strange sight to see snow on such vibrant pink…. Maybe this will be the last snowfall, who knows….but it’s all beautiful nature just the same. A very happy day to you all, whatever your weather may be!